Seville is the capital and the biggest city of Andalusia, located on the last point of shipping of the river Guadalquivir. Seville has a very long history. Also it is said that the city founding goes back to the Legend of Tarsis, the city that Herkules founded and made over to his son Hispalos. The history and the influences of various cultures, such as the Romans, the Arabs and the Normans are reflected in many buildings and sights. 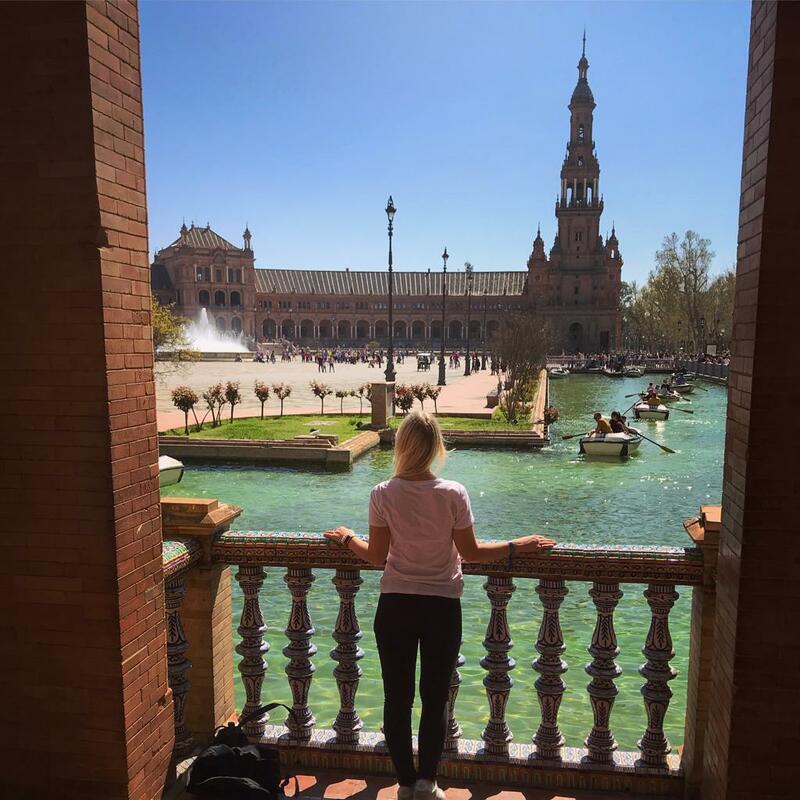 This makes Seville a unique city, which has plenty to offer. 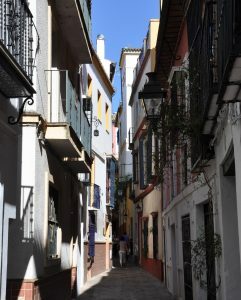 The historic part of Seville, with the little alleyways, shops and bars, is beautiful to stroll a little bit. There are tapas bars and cafés everywhere and you can sit outside to enjoy a coffee or some tapas with a cold drink. Tip: Ther city is beautiful at night, so it is worth staying there at least one night. You can find many people on the street, having fun, playing music or dancing flamenco. The Spanish culture with the tapas bars on every corner creates a great ambience. The life takes place outside on the streets, in bars, cafés and restaurants. While walking through the city you can always stop to eat some tapas or drink, have a coffee or refresh yourself with a cold drink to get to know the andalusian culture more and enjoy life to the fullest. The jewish quarter is like a labyrinth of little alleys in the heart of Seville, where some houses even directly border on the Alcazar. This quarter is really known and well-liked – not only for the long history and the good ambience there, but also for the Susona legend, which is well-known. It is worth visiting this little, almost own city in the middle of Seville. The royal alcazar is directly next to the Santa Cruz Quarter. This important building was built in the 11th century and is one of the oldest palaces worldwide. Being a witness of various epoches with influences of the Renaissance and the Bourbons, you can discover artwork, paintings, clocks and furniture, that take you into a different land for a while. 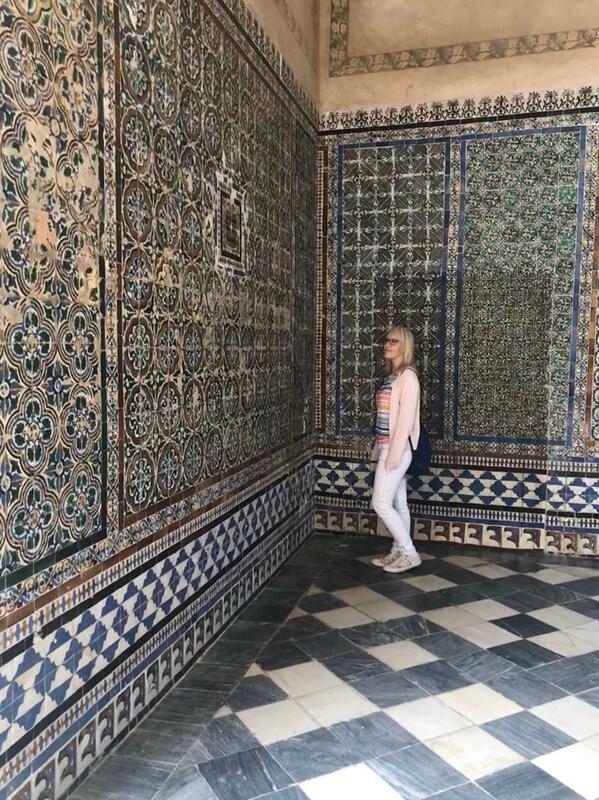 You can find many historic villas with coulerful Azulejos (tiles) and it is worth to at least visit one of them, for example the ‚Palacio de Las Dueñas’ or the ‚Casa de Pilatos’ to learn something about the history and culture of Andalusia. This villa was built between the 15th and 16th century and was owned by duchess Alba. This house has beautiful salons, patios and gardens, where you can dicover various plant species. Casa de Pilatos was built in the 15th century and has influences of different epoches, which you can see in the different styles of the salons. The tiles in this villa are really impressive and this is one of the biggest Azulejos-collections worldwide. 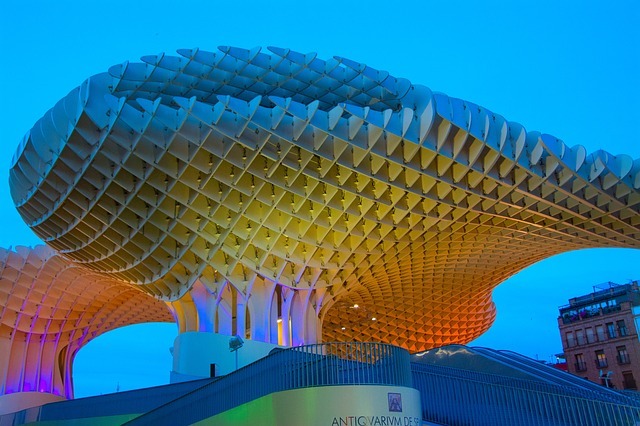 Metropol Parasol, or as well known as Setas de Sevilla (Mushrooms of Seville), is the biggest wood construction worldwide and is designed by architect Jürgen Mayer. This unique masterpiece in the center has five floors. On the lowest floor you can find the Museo Arqueológico, the offical store of the Metropol Parasol and the tourist information. On the next level there is a market. On the highest level you can find the amazing view points over Seville. You can take a walk across this artwork and enjoy the view. After, you can have a cold drink or a coffee in the bar of the Setas de Sevilla, which has the same views over the roofs and relax a little bit. 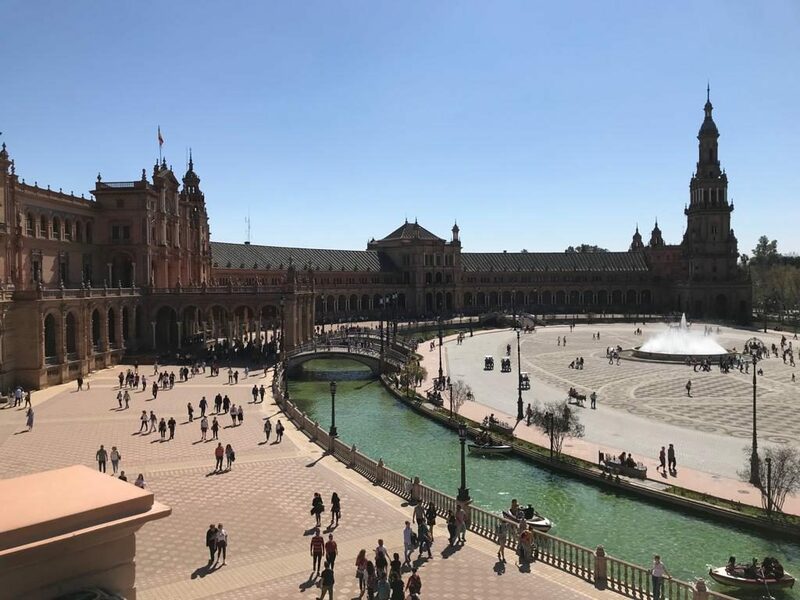 Plaza de España is one of the most popular places in the city and is surrounded by a semicircle-shaped building, which opens towards the river and is built like that to show the way to America. The four points of the channel, with a fountain in the middle, should constitute the reunion of Spain. 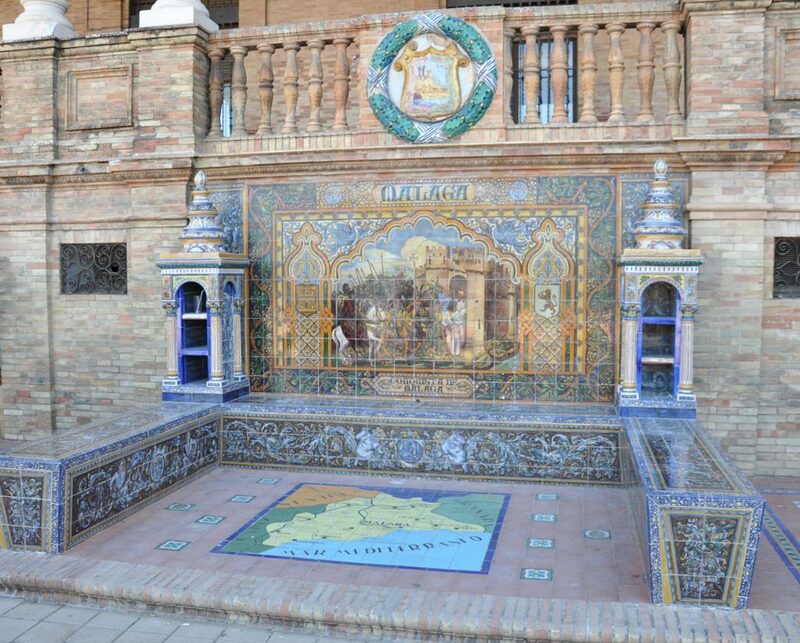 Around the place, directly at the the start of the building, you can find 48 little areas with benches, maps and armorials, which show the 46 different Spanish provinces (Seville is not included). There are always many tourists visiting to see the light spectacle of the palace, going with little boats across the channel and take photos in front of the favourite places in Spain. 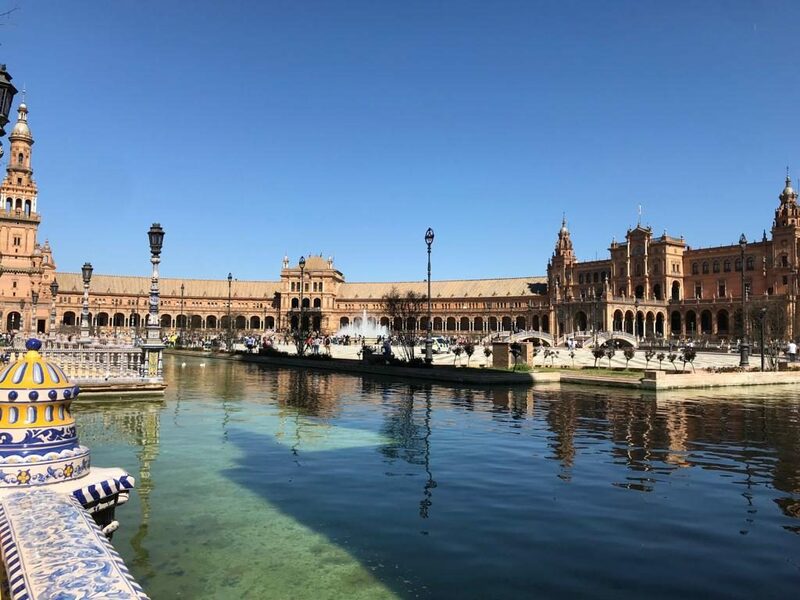 This place is definitely a must-seeing, when visiting Seville, as this ambiance is hard to find anywhere else in the world. Santa María de la Sede (Cathedral of Seville) is the bishop’s church of the archbishopric Seville and is the biggest gothic church of Spain. The cathedral was built between 1401 and 1519, is under monumental protection and also is UNESCO World Cultural Heritage. This makes this church to a really important place and when visiting Seville, you should definitely go and have a look. Flamenco is everywhere in Seville. You can watch Flamenco dancers on the streets, dancing to live-music on special platforms. If you want to see more of that typical dance, you can go to a Flamenco-show. You will find them in many places in Seville, as it is really popular there. ‘Museo de Baile Flamenco’ and in ‘Casa de Flamenco’ have shows every day. Watching one of the shows is recommendable, especially for music and dance enthusiasts. Those are just some of the things Seville has to offer: museums, buildings, alleys, markets, shops and restaurants. In Seville you can find something for everyone. Academia CILE offers a Saturday-trip to Seville to their students. On this daytrip you visit some of the important sights and places. It is also worth going there for a whole weekend or a few days to enjoy the sevillan ambiance by day and by night to the full.